Most people don’t want to talk about end-of-life issues but all of us know it’s a topic requiring early discussion and appropriate timing to be of any use when emotional, and sometimes emergent, decisions must be made. 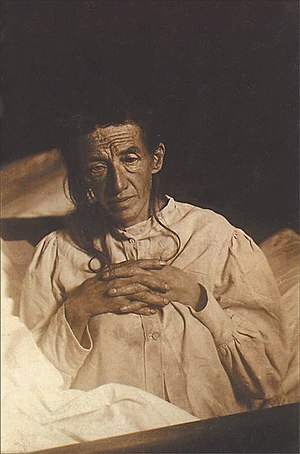 Image via Wikipedia of a patient for whom Dr. Alzheimer provided care. This patient became the model for diagnosing Alzheimer's dementia. My siblings and I benefited from my parents’ end-of-life documents that dictated their wishes should we need to become involved. My mother died in her sleep in 1994 so no active involvement was necessary but my father, suffering with Alzheimer’s for five years by the time he died in 2007, gave us a gift by spelling out in detail his end-of-life wishes set in place at least a decade before he died. Think of an Advanced Directive or Living Will as a gift to your loved ones. It certainly was a gift to my siblings and me. An organization in Washington state, Compassion & Choices, worked with Seattle University Clinical Law Professor, Lisa Brodoff, to create a new advance directive for people with Alzheimer’s and other dementia. This same law professor was instrumental in the passage of legislation in Washington State creating the Mental Health Advance Directive for people with mental illness. This statute is considered to be model legislation for other states wanting to expand the rights and planning options for people with mental illness. Bravo Washington State!!! Although not yet available, the new Alzheimer’s/Dementia Advance Directive will be based on one created by Professor Brodoff for a 2009 Elder Law Journal article titled (excerpt attached): Planning for Alzheimer’s Disease with Mental Health Directives. The new Alzheimer’s/Dementia advance directive is not intended to replace existing end-of-life documents such as a Living Will and/or Durable Power of Attorney for Health Care, but is designed to work in concert with those documents to ensure that any issues important to the patient with dementia that are not addressed in standard advance directives are honored as much as possible. What additional issues are addressed in the new advance directive for those with Alzheimer’s or other dementia? To get on the mailing list in Washington state to receive a copy of the new advance directive contact Compassion Washington: by email, info@CompassionWA.org or by calling their office at: 206.256.1636 or Toll free: 1-877-222-2816. At the very least, regardless of where you live, using their model as a guide when creating your own Advance Directive may be helpful when such Directive affects the life of a loved one with dementia. Being prepared for the unexpected, or even what you indeed suspect might be a future health issue, provide peace of mind for the patient and for his or her caregiver. That’s a priceless gift to be sure. This entry was posted in Alzheimer's/Dementia, Caregiving, Family issues, Health & Wellness, Personal Struggles and tagged Advance health care directive, Alzheimer's disease, Compassion & Choices, dementia, Durable power of attorney, Lisa Brodoff, Living Will, mental health, Seattle University.